ParisDailyPhoto: How much for a coffee in Paris? Believe it or not, we have a coffee price index in France! It's made by Gira Conseil, a consulting company specialized in the food business. They released their latest index a few days ago and tada... it turns out that the average price for a coffee in France is 1,38 €. But the price varies from one region to another; in Paris, the average price is 1,95 € with a - very - large difference between places. It is still possible to pay only 1 € or less in some places, but it can go up to 4 or 5 € in some fancy restaurant or bar. You must not forget that when you say "un café s'il vous plait", you're not actually buying an actual good, but a service which includes cost of labor, rent, taxes, etc. 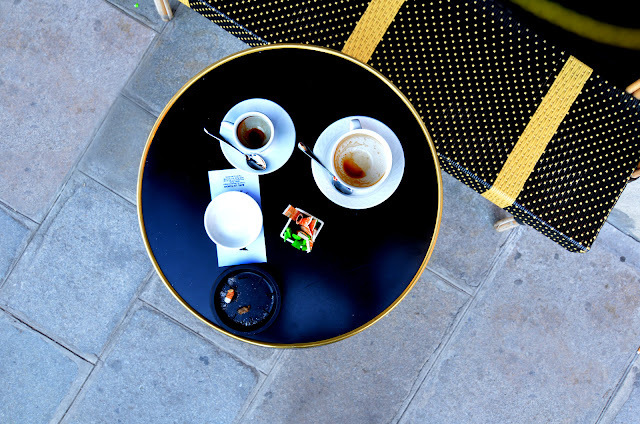 BTW I took this photo at Le Fumoir, a cool place by the Louvre where coffee costs certainly much more than 1 €! I love this photo! I love all of your coffee cup photos, actually. And I've said it before, and I'll say it again--I will gladly pay many Euros for my coffee if I get to drink it in Paris. That's really a nice photo. I'm with you, Mrs. V--great photo, and coffee in Paris is worth the price. How did you get up there, Eric? The photo is fantastic! That said, I remember when I could get un café at the Flore (for example) for just a few francs. Last time I went there (in the name of nostalgia), I paid 7 or 8 euros for a café crème and a croissant—and implicit permission to sit there for as long as I wanted, which was priceless. Thanks goodness for a coffee drinker like me, the average price for an expresso (or cafe solo) in Spain is still 1 euro, 1,20 for a big cafe con leche, cafe au lait. A little more on a terrace, 10 cents or so. I agree with Mrs. Vandertramp, I have loved your coffee photos from the very first one, which also was a straight down shot. I do think you "goosed" the contrast and saturation a bit too much. The highlights are totally burned out. There must be a way to get that deep blue, etc. and not loose the whites. Just returned from my first visit to Paris--a great two weeks--and I agree with Alexa ..... a cafe creme and croissant is worth any price at the Cafe de Flore, even if a table by the window when it's raining. Better yet, one of the Flore's lemon tarts and a superb waiter. A very fond remembrance of Paris! Lovely! I'm just going to think of it as renting a little bit of Paris for a while, then it seems cheap! @Steverino "I do think you "goosed" the contrast and saturation a bit too much. The highlights are totally burned out." Yes you're absolutely right. In fact there is a lot of work in this photo and I'm still not too happy with the result (there were too many differences of light and I had to balance them one by one! I made few changes, now, but could not do anything with the saucer above the check! I am going through withdrawal of your beautiful city after returning home to CT. yesterday after spending more than a week visiting family. Walking by all the little coffee areas (can you call it people watching in reverse?) your daily picture today is perfect. its a long holiday weekend in Paris so im sure there is a lot of coffee drinking going on. enjoy! Mmmm I can just smell the coffee....wish I was there, I so love Paris. The same next day at the Place St Sulpice 14.40 Euros. The banter (chat) in the Bld. de Charonne was fantastic. Coffee and croissants excellent. Really resent that because of other deadlines we had to agree to pay a ridiculous price at St. S! @Petrea "How did you get up there, Eric?" I just used my arm! @Anne. I'm glad your friends enjoyed the bears. It's really cool I must say. @V. 14.40 ! Gee that was expensive... and ridiculous. But Saint Sulpice is not Bd de Charonne : no Catherine Deneuve, no Pierre Hermé store around the corner... ! I know which I preferred. We had a ball in Bd de Charonne, with old ladies lending us their newspapers, people (and dogs) coming in with bags full of market veg (and in some cases veg falling out all over the cafe floor). C. Deneuve was not, as far as I could observe, present at the Place S. Sulpice. At least, there were no beautiful women there (except moi, of course). Anyway, I would have not paid a cent for her presence. Am I charged extra on a Sunday to be near a closed shop? And is this the obscenely expensive, gross and tasteless handbag-and-poser-scarf brand? If so I would probably pay extra to be as far away from it as possible. "If so I would probably pay extra to be as far away from it as possible." WEll you can bet your sweet bippy I won't be throwing any euors at Starbucks in Paris...ever. WHY? Now this is a cool place E, and I don't know where you got yourself for this shot but I bow to the master.